By Thuy Nguyen and Kate Luksha, OISS, with thanks to the many offices, staff, and students who contributed to this article. As the population of international students and scholars continues to grow, the integration of campus resources to serve them is becoming more and more vital. OISS, the Office of International Students and Scholars, collaborates with many offices and organizations around campus to cultivate working relationships that will benefit this effort, not just on campus but within the local community. International students and scholars arrive at UNH from about 85 different countries. One can see all the different countries represented by the colorful display of flags in the MUB. There was a time where UNH proudly had flags from A-Z, but our student from Zambia has graduated and gone on to a successful career! Communication with students and scholars begins before they even reach UNH. OISS advisors are in regular contact with them to ensure all of their immigration documents are in order for them to obtain the appropriate visa(s). Through the various University departments, the ESL Institute, and Navitas Pathway program, students and scholars arrive at UNH with excitement, but also uncertainties and apprehension. They arrive in fall, winter, or summer. Each group is provided a thorough orientation when they arrive. In August, for example, roughly 300 students and scholars attend a week-long orientation designed to ease the students and scholars into life at UNH. OISS invites other departments to participate by providing tours of their facilities or serving as panelists in the many workshops. It’s important for students to connect names with faces and places—the many offices and resources available on campus. The ESL Institute, in close partnership with the College of Engineering and Physical Sciences (CEPS), was pleased to welcome its first group of students from the Brazilian Scientific Mobility Program (BSMP) during the Spring 2014 semester. Currently, there are 42 BSMP students currently taking courses through ESL and CEPS. An additional 50 students are expected for Fall 2015. Students also get to explore the Dimond Library during orientation. The Reference Department welcomes international students through tours and the support continues once classes start. Reference Librarian Deb Watson and her colleagues, at the request of instructors in the Navitas and ESL programs, conducts classes to help familiarize students with the use of library resources, both electronic and paper. They also emphasize the availability and willingness to assist students with their research and other library needs. Another crucial resource students need to to be familiar with is the Counseling Center. Often times students have to make several types of adjustments all at once: environmentally, academically, socially, and personally. Dr. Xiaoyan Fan, a staff psychologist admits that, “It can be very hard to adjust to a new place, especially a new country. It is important for the students to know that UNH has an office devoted specifically for student mental health, especially in periods of high stress. Counseling Center staff is sensitive and committed to diversity, social justice and the richness of human differences. They understand the unique challenges that international students might face and are dedicated to promoting psychological well-being.” Connections with the Counseling staff starts at orientation with a workshop in Cultural & Social Adjustment and continues throughout the year with weekly International Student and Scholar Circle. As part of student ongoing adjustment support, OISS and the Counseling Center partner to provide a weekly Circle meeting for the students where they have a safe place to unwind from the week, share what’s been going on, or even just practice their English. Dr. Fan adds that, “The Counseling Center is a great resource for students. During the past fall semester, 2.6% of students who came to the Counseling Center for support were identified as international students.” About 6% of UNH students are international. Student involvement is key to staying engaged, active, and busy. Clubs, sports, and other campus events provide lots of opportunities to explore campus and the great outdoors. OISS, through our Program and Outreach Coordinator, Zainab Qari, sponsors educational/cultural trips and events. 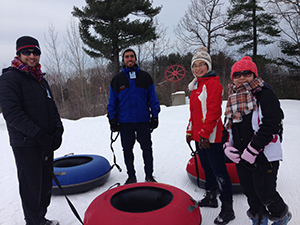 OISS also partners with Campus Recreation to provide recreational activities for all students, outdoor enthusiasts or not, to try new things, stay fit and have fun. Campus Rec offers many outdoor activities like hiking, kayaking, rock climbing and skiing. Cristian thinks the trips are “cool, they’re (the leaders) very well trained.” Cristian has done hikes with Campus Rec groups and fondly recalls his interactions with other students. “The groups are not that big that you get lost, so you can really get to know other students. There’s usually a combination of Americans and internationals, so you can get to meet Americans. The environment is very comfortable, very easy to connect with other people. They make it easy, very friendly – even if you’ve never done it before. Especially for internationals, we’re new to these adventures and outdoor experiences here, and they (the leaders) have to be very friendly, and show you the basics. They do a really good job.” Cristian hopes to try rock climbing and ice climbing in future trips. 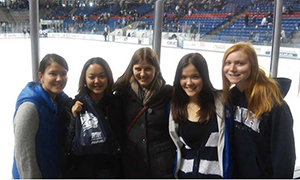 Mizuki Hidaka, an exchange student from Saitama University in Japan, offers her enthusiasm for ice hockey, a favorite American winter sport and UNH passion. “In Japan, we don’t go to school games together. I love it. It’s so amazing for me. Many students cheer the team by singing, dancing!” For this season, Mizuki has attended more than ten games so far with her American friends, who provide her with explanations, rules, game culture – like the fish throwing tradition. Mizuki admits that this type of audience participation doesn’t happen at sporting events in Japan. Once students begin to settle into their new environment, they have the opportunity to learn about the many clubs, organizations and student support services around campus through U-Day. Programs like Buddies Without Borders, Cultural Connections, International Education Week, Thanksgiving Host Program (to be featured in Fall 2015 issue), and Career & Professional Development workshops are designed to bring students, scholars, faculty, staff, and other community members together. 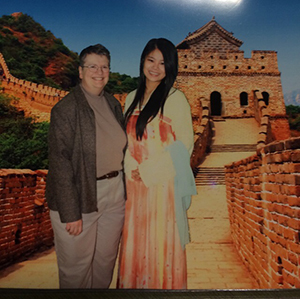 For example, Buddies Without Borders (BWB) is a collaborative organization, where three offices: the MUB, OISS, and ESL Institute work together to promote friendship. BWB pairs international students with American/domestic students in an effort to bridge cultural differences and create friendships through common interests. In this way, American/domestic students are introduced to different cultures and ideas, while sharing some American culture with their international buddy. The hope is that after the semester is over, the buddies will continue to meet, converse and learn from each other. The enthusiasm from the American/domestic students helps drive the integration initiative. Given that the MUB is the “heart” of campus, their events draw students, faculty, staff and community together. Their programs - offered through organizations, clubs, and training programs – fulfill many extra-curricular needs. When Bella wanted to get involved with campus organizations, she met with Nate Hastings, Coordinator of Student Organization Services & Leadership, who helped her figure out how to get involved. “At that time, I could not even finish the application, and Nate helped me. He assigned me a [Leadership] Coach who ended up being MaryAnne, Director of the MUB. She supported me a lot. 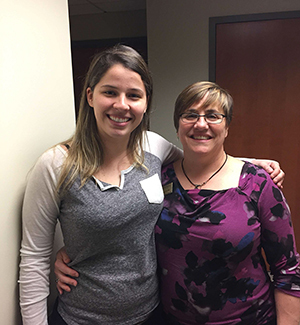 She was very patient, helpful, and friendly.” Bella wanted to improve her skills through the MUB’s Leadership Program, and MaryAnne was just the coach for the job. “She always encouraged me to do a lot of things,” says Bella. “She trusted me and then gave me more chances to do things. MaryAnne said, ‘try this, and this, and this. I believe you can do it.” Bella recently got hired to work at MUB’s Granite Square Station mailroom, where this year alone, 95,000 packages (not including regular mail!) were sent to students’ GSS addresses. This is an increase of 21,000 packages compared to last year’s. Bella noticed a problematic trend was developing where some international students, due to different naming conventions, either did not receive their packages, or received the wrong ones. Bella brought the issue to MaryAnne, and together they tackled the problem. Bella attributes her problem-solving skills and better communication skills to her leadership training and mentoring. The Career Center provides a resource called Going Global for international students in need of an H1B work visa post-graduation. Going Global allows students to search for employers that already offer sponsorship by city, state or country. Students can also use Going Global to search for employment assistance in other countries if they plan to travel after graduation. OISS does its best to make sure that the students are aware of every opportunity that is available to them, especially for when they are preparing for life after college. Part of this means providing a series of informational workshops on career planning. Many students are unsure of what path to take or what their next step will be. This is where the University Advising and Career Center (UACC) steps in. The series begins with discussing student eligibility to work after graduation, followed by “how-to” workshops on resume writing, networking, job searching and interviewing. Many students are also able to find internship opportunities in their field, getting their foot in the door for future endeavors. By connecting them to the professional world through internships and employment, students can gain experience and make new connections to enhance their learning. The international population continues to grow every year, thus making the effort for integrated service to this distinctive population more important than ever. This university-wide initiative to foster communication and connection with its international community is vital to the internationals themselves as well as to the UNH community as a whole. As these relationships grow and thrive, the university is continuing to find ways to improve its services and become a more efficient and inclusive team. It is the hope of OISS that the international students have the most successful and rewarding experience possible while they are here at UNH, in their academic studies, social interactions, and career preparation. It is also the hope that international graduates become the University’s face and voice to the larger world, sharing their experiences and the impact of a UNH education on a global scale. Stories like those of Cristian, Bella, Mizuki, and Caroline present a unique impression of the UNH community and the engagement that make this community inclusive, supportive, competitive and fun.